Project Walkway Ghana calling on all industry players: photographers, makeup artists, hairstylists, fashion designers, Beads and accessories, fashion bloggers, etc who are interested to showcase/participate at the Grand Finale. 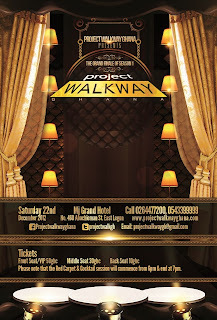 After successful auditions and series of tasks, Project Walkway Ghana is set to reveal the winner of its maiden edition. The season one finale is set to take place on Saturday 22nd of December 2012 at MJ Grand Hotel in East Legon, Accra. This will see contesting models walk down the runway in garments designed by the contesting designers. This will be rated by a panel of judges and they will announce the winner based on their scores and other considerations. The night is promised to be spectacular as there will be appearances from major industry players including Mawuli Kofi Okudzeto, Ivanna Annan, and Penelope Mawenyegah who are headlined as judges for the night. 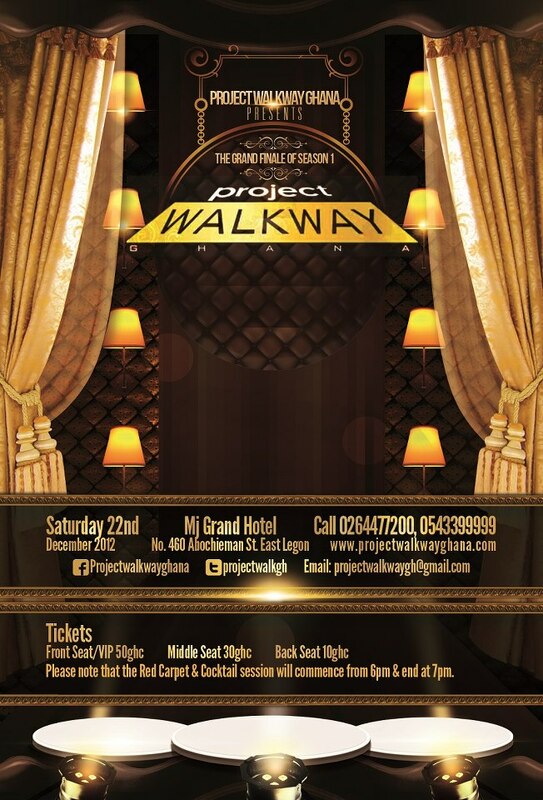 Please contact the PR on projectwalkwaygh@gmail.com for more details.